Tread Lightly with Terra Nova! In 1991 I started a service I dubbed Tread Lightly. This was a bicycle-powered landscape service that served our Santa Cruz area clients. For over twenty years the community hailed the ‘Tread Lightly’ service as an authentic, profoundly ecological approach to landscape care and as a symbol of innovation and hope. One of the principles of permaculture is “Use Small and Slow Solutions.” Tread Lightly was definitely that! Pedal-Powered Permaculture! I used the Tread Lightly service for a couple of years, then decided that I did not care enough about the lawn to hire a landscape service—not even a bicycle landscape service from a friend. The service was good when I used it, and I was wondering why I never saw his bike trailers around town any more (I still see Ken riding his recumbent around town). It turned out that the trailers, bikes, and equipment eventually wore out, and the bike service was barely making enough to pay the employees. When the recession hit, it hit the local lawn services pretty hard, and Ken had to downsize his business (still doing landscaping, but with a much smaller team and no bikes). Now that the local economy has improved, he’d like to bring back the signature bike trailers and hand equipment, but he needs to raise some capital to do it. Borrowing from banks (a traditional business solution) is not likely to work, as the business plan does not result in a high probability of a large profit to pay off the loans. So he is looking for crowd-funding to help him restart the bike landscaping business, train youngsters in sustainable urban landscaping, and bring back a distinctive Santa Cruz institution. In the years since I used the Tread Lightly service, I’ve bought an electric mower to mow the front yard about every 2 months, and let the back yard get covered with weeds (thistles, grass, blackberry brambles, ivy, kiwi vines, … ). It is now difficult even to get to the compost heap, and some of the windows on the house are not openable because of the blackberries covering them. I’ve been thinking of hiring Ken to clear the back yard for me, though I’ve no intention of actually maintaining the yard—too much work for too little reward. If I were ever to sell the house, it would probably need over $1000 in landscaping maintenance to look attractive to a buyer, but I’m likely to be living here for the next 25 years, so any investment I make needs to pay off in personal pleasure (or reduced maintenance effort) well before then. Last fall, after raking the leaves and mulching them with the lawnmower, I left a pile of shredded leaves on the driveway, with the intention of moving it with the wheelbarrow to the compost heap in the backyard. But the wheelbarrow has been full of sand for the past two years, and I didn’t get around to finding a place in the yard to deposit the sand in order to free the wheelbarrow to move the leaves. As a result, the shredded leaves sat on the driveway all winter, turning into fairly rich compost. Last fall, for Halloween, we had bought several pumpkins. We carved the big ones and put candles in them, but displayed the little ones intact on fence posts. The big ones rotted rapidly and were moved to the compost heap, but little ones were kept as decoration for most of the winter. The squirrels knocked one of the pumpkins off its fence post and ate the flesh of the pumpkin, but (surprisingly) not the seeds. 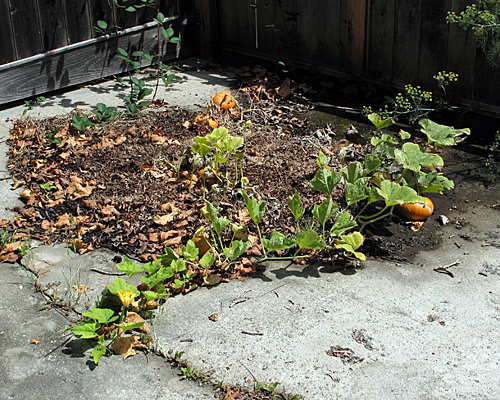 What the pumpkin “patch” on the driveway looked like by 5 Sept 2012. One of the vines has died (with a couple of ripe pumpkins on it), but the others are still doing fine. I live in coastal California, where it doesn’t rain from about May to October, and the “soil” was only about an inch thick above the concrete driveway. We have a high water table (an aquifer ends here, and the water is only about an inch below the surface), but the roots can’t grow through a cement slab, so the vines needed to be watered. There was no way that I would remember to water the vines often enough, and I didn’t want to waste city water (we have water restrictions this summer) on a volunteer pumpkin. I came up with an ingenious solution that required no money and miniscule effort. The patch of leaves was on the driveway just below the sump pump which normally pumps water collected from under the house out to the gutter. The sump pump runs a few times a day, discharging a gallon or two of water each time. All I did was disconnect the drain pipe from the sump pump and arrange a little diverter to spread the water out to wet the pumpkin patch. Automatic watering system: the sump is under the wooden box on the right, and the drain pipe is normally connected to it. Removing the drain pipe and propping up a concrete block to divert the flow was enough to water the pumpkin patch several times a day. The only problem with this automatic watering system is that it kept the pumpkins too wet. 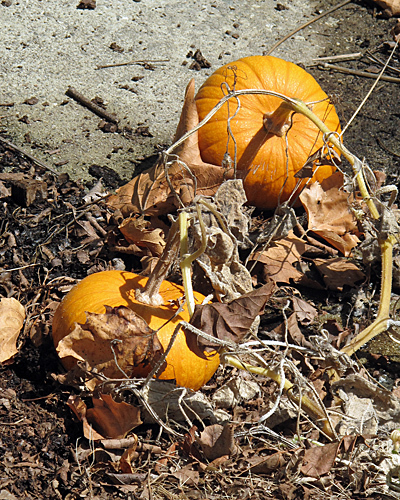 The mulch that the pumpkins are sitting on is so wet that it harbors a lot of slugs and sow bugs. The first two pumpkins look nice sitting on the driveway, but picking them up reveals a lot of slugs and sow bugs feasting on the bottoms of them. The pumpkins on live vines seem to be resisting slug attack better, and I’ve moved them a little to try to keep them drier. The pumpkins are small ones, because the seeds were from a small variety. I wonder how well a larger variety would have fared in this shallow-rooted environment.